oh yeah.. Baby is still in my tum-tum. The shopping trip had me in stitches though (and few hundreds poorer!). I had Braxton Hicks in the midst of all the shopping. I’ve been having frequent Braxton Hicks and probably some false labor contractions the other night. But nothing so painful that warrant a visit to the hospital. After all, the cramps kinda subside when i move around so i figured it’s not a real contraction. So yes, i’m still wondering how real contraction feels like. I’m also nursing a fever, flu and a bad cough. So i’m kind glad labour has not started yet cos i prefer not to be sick during labour. I get really cranky when i’m sick and the thought of having to push a baby out seems like double the hard work. So i told Dr C to prescribe me meds so i can clear the flu & cough up asap and i was given some antibiotics safe for pregnancy. Dr C also mentioned checking my waterbag levels and an internal check next week and if baby is still not out yet, we’ll set a date for a possible induction at 41 weeks cos my sugar levels seems to be on a higher side these days. Although to be honest i blame it on the honey i’ve been taking to soothe the cough (ok lah… to be fair, i also indulged in Ben & Jerry’s. Lots of it!) But of course i didn’t tell Dr C that! Some things, you just don’t tell your gynae lah ok. Kidding. Friends & family have been msg-ing me regularly to ask if i’ve given birth. Even Rusly’s colleagues have been asking him “is the baby out yet?”. Looks like we’re not the only excited ones! Me at 39 weeks. I love my new pyjamas. So cute! But Rusly told me i look like a Vietnamese maid. Boohoo. It’s even harder to sleep now. I sleep for 3 hours interval most of the time and each time i toss & turn in bed, Rusly will wake up and ask “You ok? Sakit ke? Contractions eh?” Lol. Somebody will be having sleepless night for a week or so. I’ve been tempted to try other natural labour-inducing method and then i saw this hilarious video on Youtube. So cute lah this woman! Hahaha. I might just be tempted to do this if i still don’t have any labour signs by next week! But probably not when Rusly is at home. Super embarrassing sak. Dah macam ni. 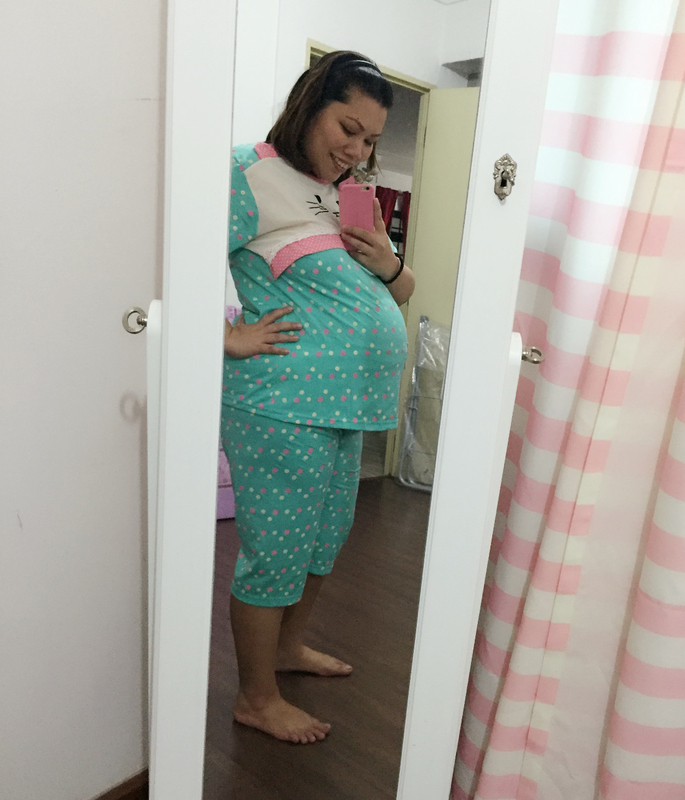 awww so cute la your belly! Lol mcm sembunyikan bola kat dlm! Just a couple more days to go! And u know what.. Crazy dance works! It was one of the things i tried to induce labour! Hahahahaha ok i shall try that next week if baby still refuse to make an appearance!